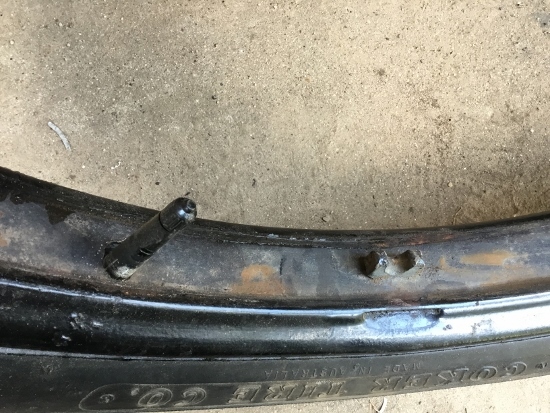 Model T Ford Forum: What wheel ?? Model T Ford Forum: Forum 2018: What wheel ?? Is this a Kelsey Hayes wheel? There is no such thing as a Kelsey Hayes Model T wheel. The two companies did not merge until the end of Model T production. Model T wheels were made by Prudden, Hayes, Firestone, Kelsey, and Ford. The Question is, who made this wheel? LOL, Bob you made my day. I think, more to the point/question, who made that cleat? A "google" search reveals that Kelsey Hayes is an "Ottowa based singer / song-writer . . ." Maybe gonna be a "big wheel" on the music scene ? I have two sets of lugs, bolts and nuts that came off T rims, but they are the ones with the cone shaped nuts. Someplace I have the number that I found in an old supply catalog. 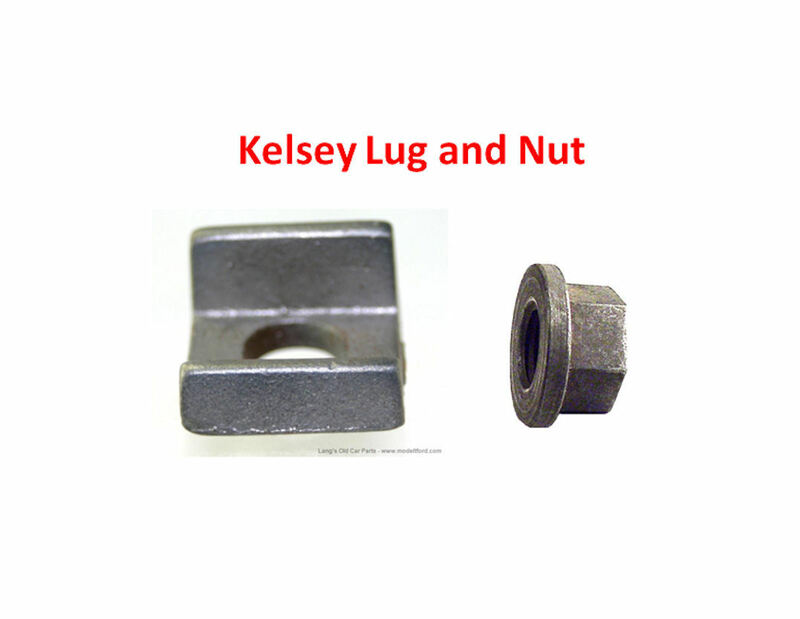 Kelsey and Hayes had not yet merged in the Model T era - they were separate companies. I understand that Pruden became Motor Rim and Wheel. Thanks Mark, for the photo, I must have the Walmart version-cheaper. The rims on this car do not have the lug mounted on the rim. Anyway I need a rim for a spare and had no idea what to ask for. I guess it�s Kelsey rim with out lugs? That locating lug is important, it engages one of the rim bolts and keeps the rim from spinning relative to the felloe. If the rim spins relative to the felloe, it can tear the stem out of the tube. Look at your rims carefully for the remains of that lug, they sometimes get torn off or otherwise come up missing. I had a rim with a missing lug once, I fabricated a replacement out of some steel plate and MIG welded it into place. 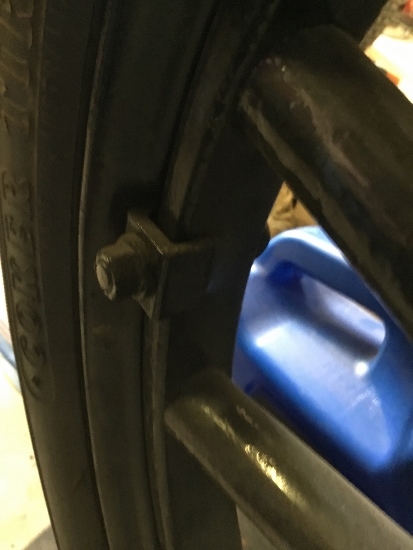 Thank you Mark, I didn't realize where the lug was, I saw it as being visible with the rim mounted, but of course this is not the case. Pulled the rim and there that fellow sits. Thanks again for your time and help. 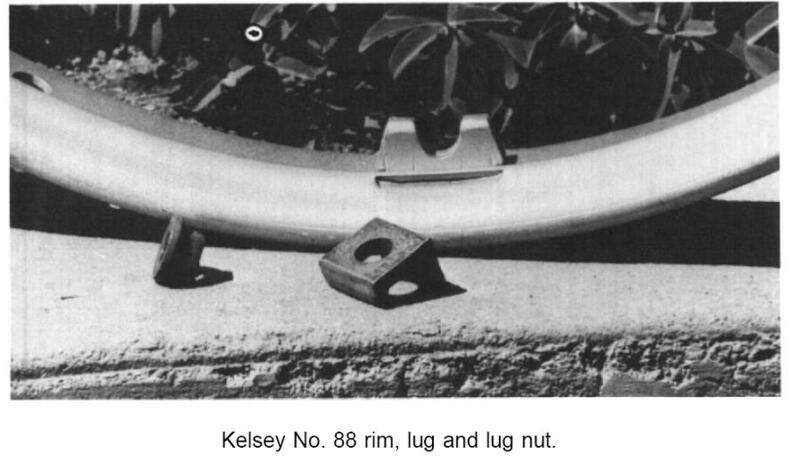 The photos Mark posted of the Kelsey 88 rim show the type with the rolled in bead which jams on the outside of the felloe. The slot to accept the shorter foot on the lug penetrates that bead and allows water into the rim/tyre assembly, causing rust problems. 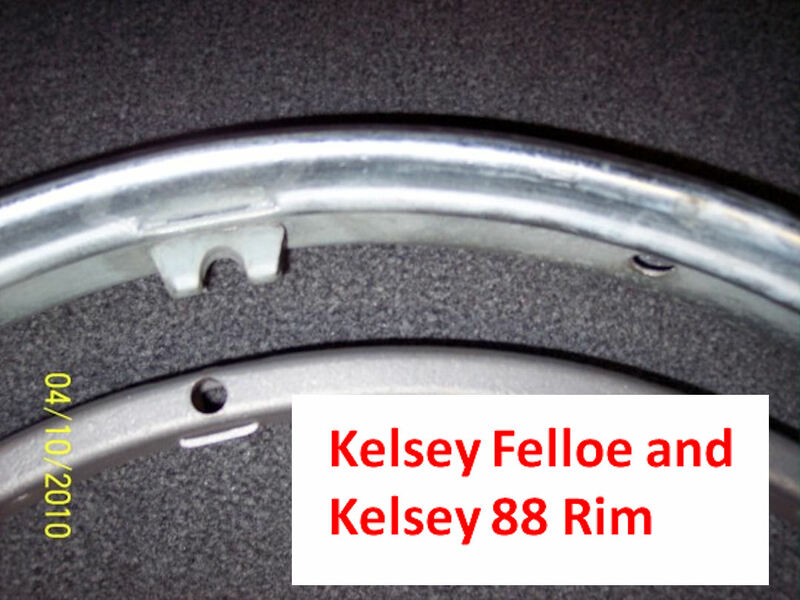 Kelsey also made 88's with the solid bead and flat base on the rim. These are a much better idea. Allan from down under, where Canadian made Kelsey rims rule! Bob, I just noticed, in your last photo, the tyre on the rim is branded, 'Coker Tire Co' and under that brand is the legend, 'Made in Australia'. To my knowledge Coker has never had a plant in Australia and has never had tires made here either. Perhaps they purchased the 'Olympic' brand moulds from Australia and had tyres made with their brand in place of the 'Olympic' brand. I have seen these with 'Lucas' and a plain no brand on 'Olympic' tread tyres, but I have not seen 'Coker' branded Olympic treads. If only whoever holds the moulds would make tyres like the 'Olympic' Australian made tyres, we would all be far better off. Vintage Rims in New Zealand make new Kelsey style rims. Their rolling process leaves the metal an even thickness across the width of the rim, as opposed to the 'spun' process, which can leave the metal rather thin where the 'curves' in the rim profile are. I believe their rims are available in the US from the main vendors too. Adrian, does someone in New Zealand still do cad plating, or is that a generic term for silver looking plating over there? We used to be able to have bits cad plated but it was the yellow looking stuff. Now I have rims electro plated in zinc. It is the correct process for T rims but doesn't last as long as galvanizing. Hi Alan, yes we have a genuine Cadnium plater in ChCh. Zinc would be the next best thing I believe, probably cheaper too.